‘It’ll seal. Just give it a minute. The tear isn’t that big,’ explains an overzealous Dan, failing in his attempt to shield the wounded tyre from view. ‘Are you sure? There’s sealant everywhere and we have plenty of extra tubes. Let’s just throw a tube in,’ I protest. Dan reaches for his jersey pocket and removes another C02 canister – we’ve got two between us – in a futile attempt to re-inflate the wheezing tyre and save himself from getting covered in more tubeless sealant. I get it. It’s messy work. I throw a tube his way and it lands in his reluctant hands. But there’s no real rush. We might be two hours from being done and dusted, but the late season spring sun is high in the sky, our pockets are full of trail snacks and our water supply is still plentiful. Talks of a return with a larger crew are already taking place. 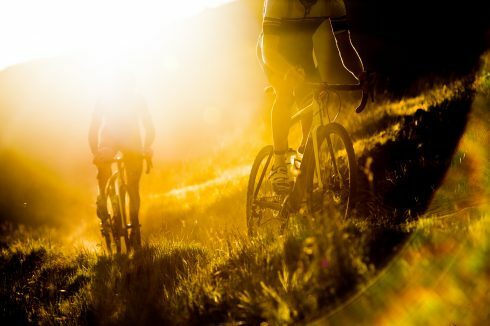 This is off-road cycling at its best. We’re off the beaten track, there isn’t a car or person in sight, and there’s no need to delicately hold a road bike off the bitumen. 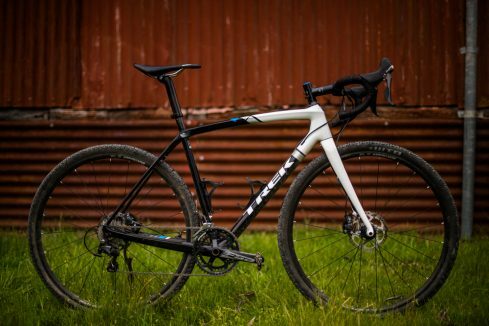 We’re on Trek ’cross bikes – they’re meant to be a little beaten up. Dan lays the bike down on the gravelly path. Bush mechanics at its best. 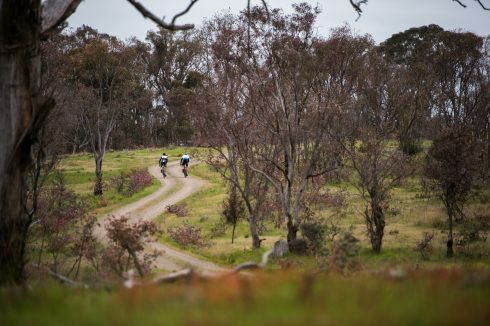 We’re perched on a magnificent ribbon of single track following the stunning Murrumbidgee River. It’s flowing freely. 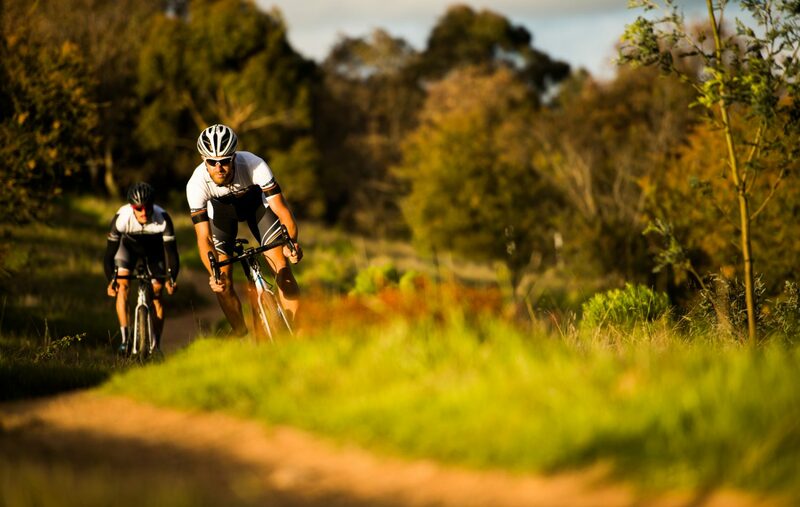 We’re perched on a magnificent ribbon of single track following the stunning Murrumbidgee River. It’s flowing freely. We’re tempted to scramble down its banks for a closer examination, but today’s circumnavigation around and through Canberra is an all-day affair – at a stretch. 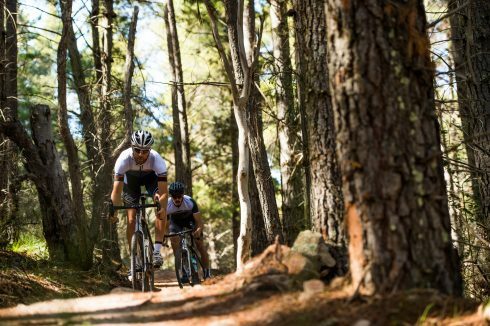 The Centenary Trail links the vast outer rim of off-road and sealed trail networks, city bike paths, horse tracks, sections of the Bicentennial Trail, rivers, creeks and city icons into one big 145-odd-kilometre lap. Half is completely off-road, while the majority of the remainder is along dedicated cycle paths. 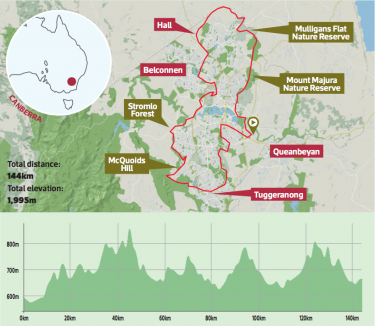 It’s the Canberra scenic route in the shape of a GPS-mapped nutshell. 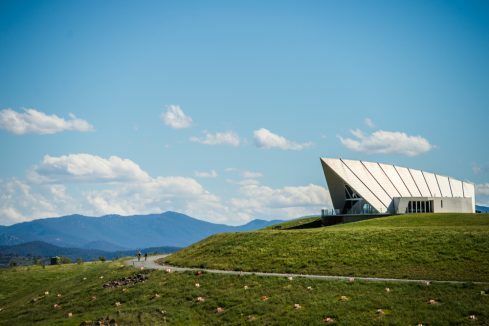 I first heard about the Centenary Trail in 2014 – not longer after the trail’s opening on October 27, 2013 – while on a photo shoot at Stromlo Forest Park with photographer Damian Breach. He was one of the (if not the) first riders to complete the full course in a single day. Such was his eagerness to inspect the validity of the trail’s claims, his solo, single-day attempt occurred before all the signage had even been erected. 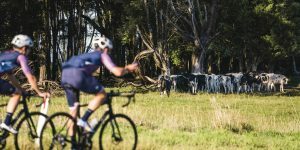 With the help of a number of calls to trail builders along the way to ensure he was following the correct path, Damian was soon back at his residence, enjoying the fruits of his nine-hour ride. Today, in classic Damo style, he has come equipped with a Focus Mares cyclo-cross bike and a mule-like amount of gear strapped to his shoulders and back. He’s our guide for the day. A proud Canberran, Damian speaks of the city with the kind of in-depth knowledge only a local could have. ‘We’ll roll from Bspoke Cafe inside Pushys bike shop at Fyshwick at 6:30am. 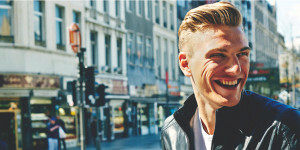 The coffee and brekky is great – and they’re lending me a bike.’ Classic Damo. Despite being warned off by many (who hadn’t actually tried) from taking CX bikes along the trail, we find ourselves with a couple of doppios in the early hours of an unassuming Thursday (it’s a working week after all). We’d completed a short reccy the day before along the final lower west and east sections of the trail and been so excited at what we found that we barely slept a wink. The bikes were capable, and our GPS map was loaded into the Wahoo ELMNT – a must. 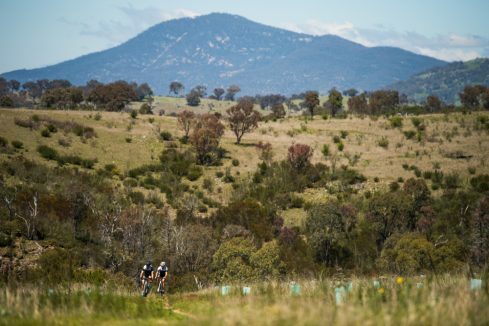 From the legendary mountain bike trails of Mount Majura (Majura Pines) and the Kowen Forest to the barely decade-old Stromlo Forest Park – now a global focal point for trail building and sustainability since the mountain was devastated, along with more than 500 homes, in the 2003 bushfires – you could say the Centenary Trail was there the whole time. Alas, much of the missing links were closed to cyclists prior to its development. A larger 30km stretch in the north-west corner, the literal high point on the ride, was also missing. More on that later. 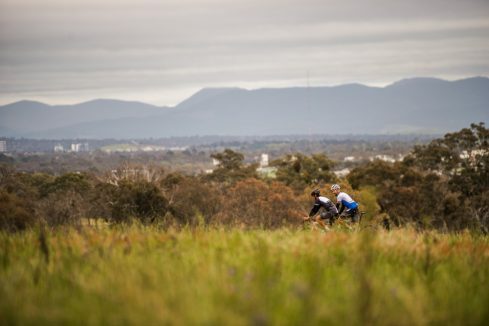 The Centenary Trail was opened as a way of celebrating everything the city of Canberra has to offer, from historic landmarks to iconic buildings, incredible viewpoints and unique landscapes. The emphasis here is on unique. to just how much consideration was given to ensure the trail pays tribute to not only the city’s landscape, but also our greater national heritage. The entry to Mount Ainslie Nature Reserve is found at the rear of the main building and we hook left onto Sock Trail (don’t bother taking notes of trail names, street signs don’t exist out here), and immediately feel like things have begun. ‘I’ve gotta drop some pressure out of my tyres,’ Dan says, stopping abruptly. ‘Me too,’ Damian adds. Knowing little about the terrain to come – apart from Damian’s description of ‘loose over hard’ – I too let some pressure out. 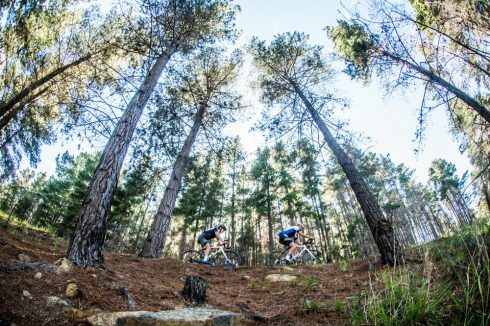 Over the next hour we steadily climb, descend and skirt the western edge of the mountain and drift into Mount Pines Reserve, its eastern side a mountain bike haven. While we feel like we’re away from it all, for the most part, suburbia lays barely a stone’s throw from our left shoulder. It’s a comforting feeling, especially for those unsure of how they’ll cope with the terrain and distance, or in case of an unfortunate accident. The trail here rolls up and down with a feeling like you’re always steering a little to the right. Pebbles litter the hard-packed red earth to create an untrustworthy surface. It’s slippery. We do our best to keep things under control as I pass a corner that, almost a year ago, caused some minor discomfort as my knee, shoulder, elbows and hip found themselves sliding along the ground. As I said – comforting. Pebbles litter the hard-packed red earth to create an untrustworthy surface. We’re moving along swiftly, having decided early on to skip the Ainslie lookout, and soon enough reach the Federal Highway. A tunnel has of course been dug for us to pass under the city’s major north-east artery. Accessibility is a huge priority for the Centenary Trail, and small details like this keep it safe for all users. Despite experiencing an above-average rainfall for the winter and a snowfall that had blanketed the mountains around the city (and lit up my social media feed), we’re greeted with stellar conditions as the sun begins to rise high into the spotted clouds. 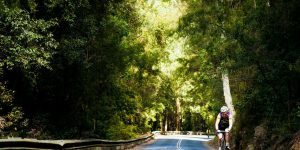 Temperatures are in the teens as we lift our bikes over the gate and ride into the next stretch of trail through the Goorooyarroo Nature Reserve. The fire road is fast-moving, and we’re treated to a rush of wildlife, both grounded and airborne. Cockatoos sit in cleared, grassy farm fields next to small dams, and while Damian does his best to creep up on them for a shot, he fails – numerous times. We keep moving. Roos bounce alongside, tempting us to pick up the pace and race to the next corner before darting into the eucalypt gum woodland. I’m following Damian along the white gravel road, the speed rising as the road heads downward. 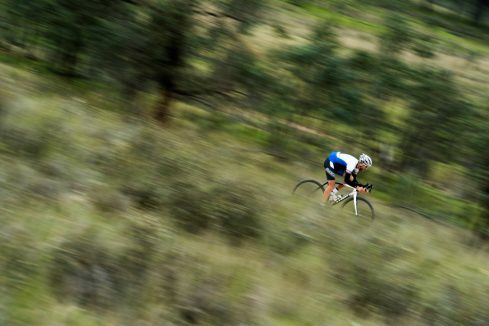 Distracted by the change in scenery, from the dusty scrub of Majura to green yet spaced-out bushland, I fail to hear Damo hit the brakes – hard. I pull on the brake levers in an attempt to stop before plowing into his rear wheel. A huge electrified fence stands in our way. It doesn’t look good. Damian opens the gate door to Mulligans Flat. ‘Please, after you.’ We’re in. We’ve entered a truly special area of Canberra. Officially ‘closed’ to feral predators, including foxes, cats and certain herbivores since 2009, the 11.5km of fencing is part of a larger protectionist action for native eucalypts, including box gums, along with a general study of the ecosystem. Previously extinct mammals have since been reintroduced, including the very cute – yet seldom seen, unless you’re here during a twilight visit – Tasmanian bettong. Thousands of dead logs have also been dispersed throughout the area as another way to study adjacent plant and animal life. It’s an outdoor lab secured for future generations. 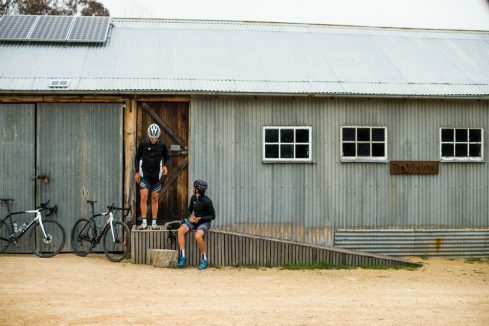 An old 1930s woolshed looks like a great spot for our first little pit stop, about an hour and a half in. Unfortunately, it’s all locked up, and without any water around, we promptly push onto Forde, where Damian says we can top up our bottles. During the hotter months, it’d be a safer move to bring a hydration pack. We reach Forde, make a sharp right-hand turn onto the cycle path and head toward the newer sections of trail at Oak and One Tree Hill – a spot few had visited prior to the trail’s opening. ‘The next section is pretty hard going – it’s long and it’ll take the best part of an hour and a half,’ says Damian, who is starting to question his decision to ride the full course. It’s a long day. It’s worth noting that the Centenary Trail is used not only by cyclists, but also walkers. 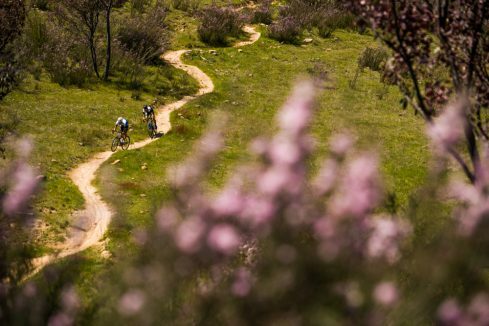 It’s a two-way trail, so keep your wits about you when blasting through tighter sections of the ride. We hug the border between ACT and NSW while steadily twisting our way up, higher and higher. Gradients vary between 5% through to first-gear-crushing double digits. We’re on our way to the high point of the ride, a touch below 900 metres above sea level. The trail here is purpose-built; you can see it and feel it. It has been thoroughly considered, and while no doubt a challenge physically, it shouldn’t test the skills beyond your limits. Steadily twisting our way up, higher and higher. Gradients vary between 5% through to first-gear-crushing double digits. The trees make way for pasturing land and the cityscape fills our vision. You can see it all from up here; our start point, Telstra Tower, the Tidbinbilla range and the city in its entirety. It’s quite a sight – not to mention a viewpoint that had rarely been visited, due to its remoteness, prior to the construction ofthis sector. The high point also signals that lunchtime, at Hall, is near. Cyclists have been completely considered along here, with steel ramps and platforms choppered in during construction. The single-width track snakes its way over the next 5km. We arrive at the Daughters at Hall cafe and get stuck into shakes and sandwiches. One-third down; 100km to go. It’s at Hall where Damian bids us a temporary adieu. Fresh off the plane from a trip to Japan, and complete with ‘plane legs’ and what seems like a case of delayed-onset man flu, he jumps ahead via motorised transport while leaving us to negotiate the next hour through the streets of Belconnen, past the Australian Institute of Sport, around Black Mountain, across to the Arboretum (a spot visited in Cyclist issue 12) and through the unique Cork Oak Plantation on our own. A busload of school kids scatter throughout the forest, confusing our sense of direction. Good thing we’ve got that GPS guidance. We spot a pair of waving arms above our right shoulders. The map keeps us on the lower levels of Forest Drive within the Arboretum, but Damian clearly wants us up there. The view, enjoyed by over a million people since it was opened in 2013, is now home to over 100 mini-forests of rare and endangered Australian natives. Like One Tree Hill, it’s one of the few places that offers panoramic vistas of the city. Give this place another 100 years and it’ll no longer be the grassy hillside it is today. We bend to his demands and clamber up to the village, passing crops of western Queensland white gum, Yoshino Cherries and sugar maple. 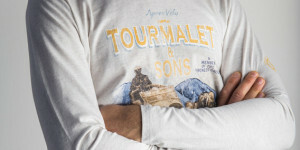 No, we’re not dendrologists – the names of each plantation are marked on the map, made available in the village centre. It’s an impressive list. Our navigation skills lean on the GPS again as we head south-east into the fringe of Stromlo Forest Park, the stage for the 2009 UCI Mountain Bike World Championships. Unfortunately, there’s little time for a lap of the purpose-built criterium track, which sports an unfortunate yet coincidental male-appendage shape. We’re on our own again as we climb up Cooleman Ridge, overlooking Chapman and Woden down below. Again, the closeness to the city is astounding. The trail is barely two feet wide at times, and the short but steep descents and ascents beat the final ounces of energy out of our bodies. 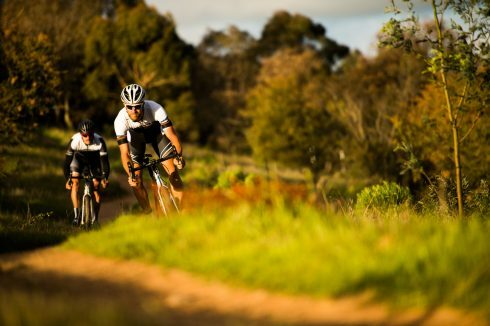 A short but well-received road section takes us down Kambah Pool Road towards the Murrumbidgee Discovery Trail. This particular section is noted as being of moderate difficulty, and it’s easy to see why. The trail is barely two feet wide at times, and the short but steep descents and ascents beat the final ounces of energy out of our bodies. ‘Pssssssss’. Dan’s tyre deflates in an instant. I pass him that tube, and it’s not long before we’re off again. We follow Damian down an unrideable section of trail, questioning the legitimacy of his local knowledge before realising it’s simply to enjoy the scenery from a little hidden river viewpoint. Huge rock walls rise sharply from the water’s edge and really give perspective to the landscape around here. It’s as rugged as it is stunning. Our final test comes through Tuggeranong and up into the Long Gully pine plantation. Grassy shrub gives way to skyward pines, and the sheltered path brings welcome relief from the heat. There are just a couple of final tests remaining before the few kilometres back to the shop. I check my phone. It’s a message from the guys at Pushys. ‘Hey guys, we’ve packed up for the day, but you’ll find a few coldies in a box outside the front door.’ Cheers, pals. The bottom is in sight, and we can taste the hops. After nearly nine hours elapsed time, a beer seems like the most fitting way to cap off another trip to the country capital. We’re spurred on to give it everything to the top of Red Hill Nature Reserve. It’s a savage four minutes, but it’s worth it. Unfortunately, it’s a staircase back down, so we negotiate the steepness as best we can. The bottom is in sight, and we can taste the hops. After nearly nine hours elapsed time, a beer seems like the most fitting way to cap off another trip to the country capital. 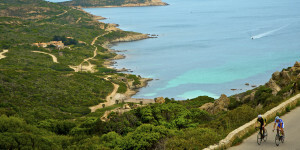 Don’t be fooled by the distance of the Centenary Trail. It’s a long one, but there are endless rewards along the way. It’s an all-day escape. If you’re coming from out of town, plan to stay at least one night; two if you can manage it. You’ll be up early and back late. 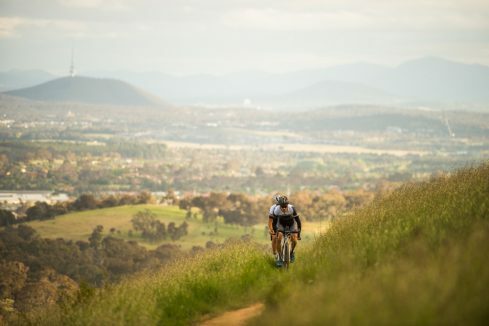 This 140km trail offers an entire circumnavigation that continuously takes your bearings away from you at one moment before gifting them back with the presentation of an iconic view, be it Parliament House in the distance, Telstra Tower looming overhead, or a glimpse of the entire city from a ridge on its northernmost border. 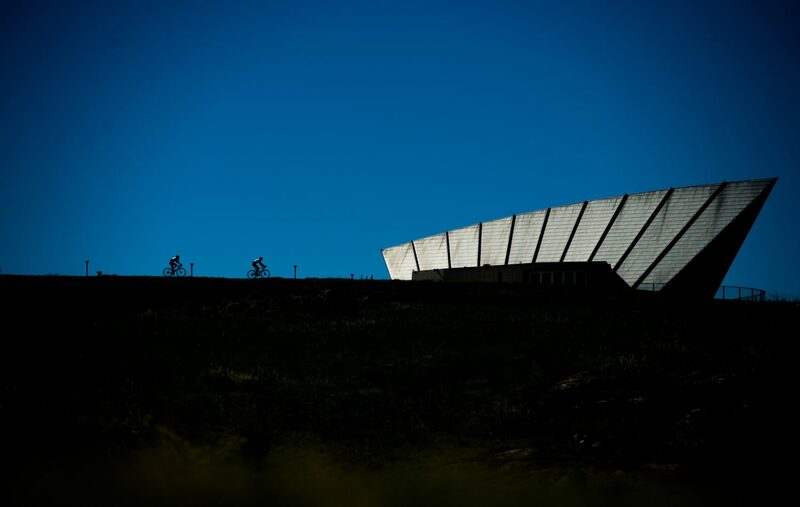 Two years ago, we found ourselves staring at a completed Canberra route pondering ‘where next’. Well, it seems we just found it. Now to study that map again. 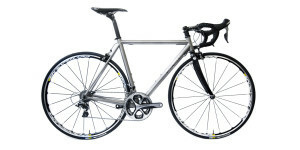 For the Centenary Trail we were armed with Trek’s Boone 5. The CX platform has been around for a few seasons and has earned a reputation as one of the most highly evolved in the ’cross market. Keep a look out for the new Crockett. 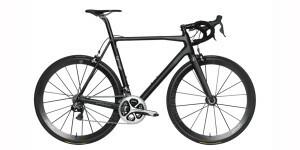 Key frame features include the patented IsoSpeed technology that separates the seat tube from the top tube and seat-stay junction. Initially developed for Trek’s cobbled classics star Fabian Cancellara, the ‘engineered flex’ soon found its way into the Boone. The pivot system, running on cartridge bearings, creates a more forgiving ride, perfect for something like the Centenary Trail. We fitted the burlier WTB Nano 40c converted to tubeless – a must with such rocky terrain. Aside from tyres, the only significant change we’d have made would have been with gearing. For this sort of ride, an 11-25 cassette made for some grinding climbing situations. Something beyond a 32-tooth option would have been ideal. Let’s make one thing clear: the Centenary Trail has dedicated signage, but it’s not sufficient to rely on that alone. Even with the Strava map loaded into a GPS computer we had to backtrack a couple of times. Bush areas are generally well marked, but the urban areas can become a little more complicated. Despite this shortcoming, it’s actually difficult to get truly lost. 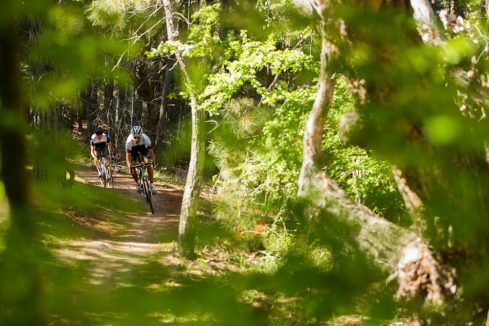 If you do find yourself on an adjacent trail, there’s a good chance you can find your way back to the course further along. 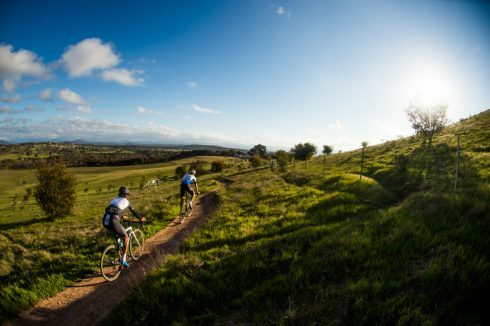 The Centenary website recommends a seven-day in-and-out expedition for those on foot, while pedal-assisted visitors can enjoy options to complete the lap over anything up to three days. The best part is being able to complete it over multiple days without having to venture too far from the hotel – depending on how you plan to do it. The trail is rarely far from the city limits, with only a couple of sections leaving you to feel completely free from suburbia. Moving time to complete the lap. Elapsed? Much longer. Times we lifted our bikes over cattle gates. Grams of salted peanuts consumed over two days. Everyone has their vice. Millilitres of tyre sealant used. Hotel elevators soiled following our car-park bike wash.
Cyclist drove from Sydney to Canberra the day prior to taking on the loop. 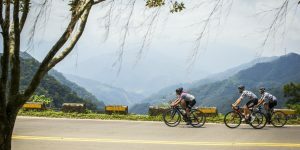 It is, theoretically, possible to do it all in a single day, but with anywhere from seven to 11 hours of riding on the cards, we advise staying at least a night or two. We stayed for two nights at the East Hotel in Kingston – also a good location for a ride-in, ride-out lap. Dan and I, while the best of friends, stayed in separate one-bedroom apartments. Each room was sufficiently equipped with everything a couple of dirty and sweaty riders could need, including a full laundry, spacious shower and bathroom along with ready-to-cook kitchenette. A king-size bed is probably a little too much for a single person, but after a day on the trail, you’ll want plenty of space to rest those weary legs – not to mention arms, neck, back and shoulders. Bspoke, inside Pushys, is exactly the kind of cafe a cyclist desires: great coffee, tasty and quickly prepared food, healthy trail-snack options and a huge bike shop for last- minute essentials. Meanwhile, you’ll find a number of cuisine options within the Canberra Centre precinct in Kingston. We found a great little Thai place that served up a feast big enough to fill a double-lap attempt. Maybe next time. Our main lunch stop on the day was in Hall at the Daughters at Hall cafe, an amazing little spot that has been operating for more than 120 years! They passed the milkshake test with flying colours. Visit Canberra took care of our logistical needs, ensuring the East Hotel was ready and waiting for our arrival. As always, the team provided us with a host of culinary options to consider during our stay. We couldn’t have completed our lap without the generous support of Trek. They allowed us to make a mess of their red-barn workshop while we converted the Boones to tubeless and made a few other small adjustments. They were returned in more or less good condition, barring a little residual water following our high-pressure wash. Santini clothing kept us cool during an unseasonably warm day, while BBB eyewear ensured our peepers were protected from flying stones, sticks and general bush scrub. Shimano supplied a couple of roadies with shoes more suitable to the dirt (and river), while our man on the ground, in the trees, on the bike and in the car, Damian Breach, was a fantastic guide once again.